Joseph Lallo is an Associate Saxophone Teacher at the Melbourne Conservatorium of Music at the University of Melbourne, and performs internationally as a soloist and chamber musician. He is the Artistic Director for Melbourne Saxophone and The Melbourne International Saxophone Festival. Kay Zhang is a developing and thriving entrepreneur who advocates herself through chamber music and is an interdisciplinary collaborator. She is currently founding members of the Ensemble du Bout du Monde and Kollektiv International Totem. Kay thrives in working with developing composers and collaborations with other art disciplines. She has a large interest in visual communications, interjecting social memes into her work and curates many different projects and platforms around the world. She obtained her education in Australia and furthered her practice in France, Hong Kong, and Switzerland. Kay has great interest in cross-culture, political identity, human gender rights and environments. Nick Russoniello, one of Australia’s most dynamic young artists, enjoys an exciting and varied performance career both in Australia and abroad. Nick has been the recipient of a number of major awards including the 2011 ABC Symphony Australia Young Performer of the Year and the 2013 Fine Music Kruger Scholarship. Nick has appeared as a soloist with the Adelaide, Queensland, Melbourne and Sydney Symphony Orchestras and as a guest artist with many of the nation’s leading chamber music groups including the Acacia Quartet, Omega Ensemble and the Sydney Camerata Quartet. Nick’s recent performance highlights include appearing at Sydney Festivals Symphony in the Domain as a soloist with the Sydney Symphony Orchestra in front of an estimated audience of 50,000, touring regional N.S.W as a soloist with with the S.S.O., performing at the World Saxophone Congress (Scotland) with Continuum Sax and renown Dutch Ensemble The Four Baritones and completing a number of recordings and broadcasts for ABC Classic FM and Fine Music 102.5. In 2014 Nick released his debut solo album Between Worlds and undertook a national tour. Nick appears regularly as a member of the Sydney Symphony Orchestra and in 2016 will appear with the Australian World Orchestra and the Australian Opera and Ballet Orchestra. 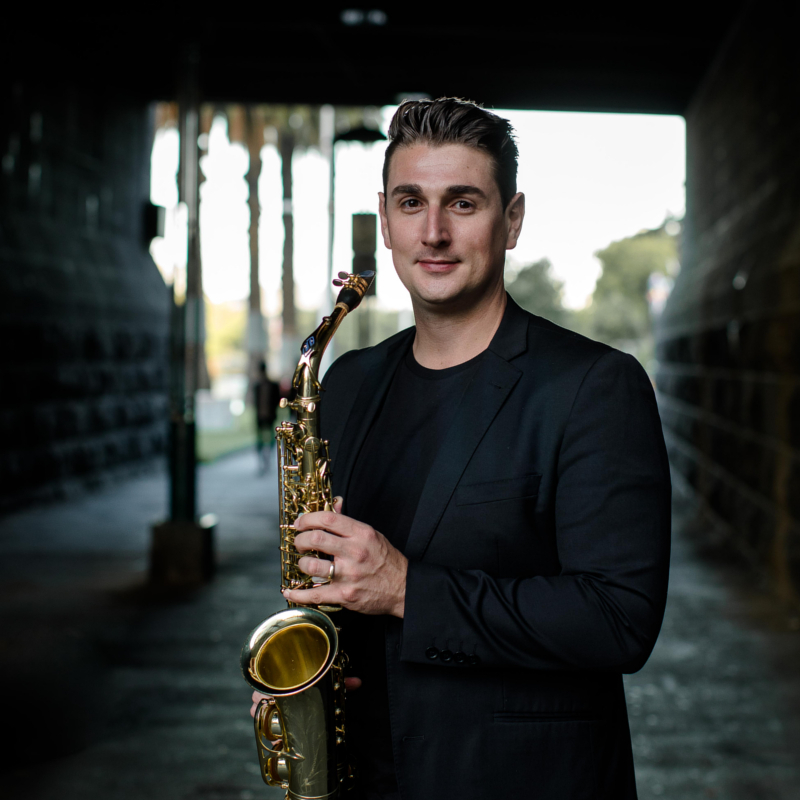 Nick is a sought after chamber musician and performs as a member of Continuum Sax (Australia’s foremost saxophone quartet), Duo Histoire (with guitarist Murilo Tanouye) and The Sax Summit. Alongside his performance achievements Nick’s original compositions for saxophone have been performed by world leading saxophonists including Niels Bijl (NetherLands), Jay Byrne (Australia) and Andrew Smith (Australia). Nick is a Yamaha Australia Artist. Dr Diana Tolmie has led an impressive life as a freelance woodwind specialist exploring a multitude of genres, performing in countless interstate and international tours, plus live radio and television broadcasts. Appearing with many Australian professional orchestras and the acclaimed Malaysian Philharmonic, Diana has additionally explored chamber music with her nationally recognised group Collusion, which continues to commission, record and perform Australian new music and dance collaboratives. A recipient of the Churchill Fellowship Award and the Queen Elizabeth Trust Scholarship, her more recently Arts Queensland and Australia Council for the Arts funding has contributed to her saxophone activities. This included her featured solo with the Mulhouse Symphony Orchestra in the 2015 XVII World Saxophone Congress; and the commissioning and recording of new Australian works for the Queensland Conservatorium Saxophone Orchestra. Diana is full time Lecturer, Professional Practice at the Queensland Conservatorium Griffith University passionately teaching performance, pedagogy, musicians’ health and vocational preparation. Her teaching excellence has been recognised and awarded an AEL Group Learning & Teaching Citation (2014), and a Highly Commended in the “Employability within the Curriculum” category of the Griffith University Awards for Excellence in Teaching (2016). She is currently endorsed by D’Addario Woodwind. .
sporting family in Gippsland, Sara was fortunate to have her curiosity for music nurtured. Sara attended The University of Melbourne completing a Bachelor of Music and a Bachelor of Teaching. During this time, Sara studied with Ian Godfrey and decided to major on baritone saxophone. During her undergraduate degree, Sara was the recipient of the “Lois Singer” Foundation Award for the most meritorious music student completing the Bachelor of Music/Bachelor of teaching degree. Sara decided to return to University to complete a Master’s of Music majoring in Performance, she was the first female to attain a Master of Music Performance on the saxophone in Victoria. Sara has been a member of “SAXE” saxophone quartet, who performed at the World Saxophone Congress in the U.S.A in 2004. Sara has more recently performed with the Hador Saxophone Quartet, The Melbourne Saxophone Ensemble and Orchestra Victoria. Sara is particularly passionate about delivering quality music education to children from the country. She has worked in the South Gippsland Schools’ Music Program for the past ten years, teaching clarinet, saxophone and classroom music, as well as leading the Senior Wind Ensemble. In her spare time, Sara is the conductor of the local Wonthaggi Youth Brass and loves to play golf and tennis. Jade Norfolk is the General Manager for Melbourne Saxophone, Ensemble Françaix, and music production company, Scintillations Music, and the Festival Manager of the Yarraville Festival. She began her career in the arts while studying for a Bachelor of Music (Composition) and Diploma of Creative Arts at the University of Melbourne, later completing a Diploma of Event Management. Jade was the stage and event manager for the Spring Early Music Festival, 3MBS’s ‘Chamber Feast’ Festival and Impressario by Opera Down Under. She was the Orchestra Manager for John Hopkin OBE AM’s Masters of Conducting, the Orchestra and Project Manager of My Music Room, and was the Music Outreach Program Manager at Melbourne Youth Orchestras. Here Jade produced a variety of programs, including live-streamed Masterclasses, the concerto competition Virtuosity, a residential summer camp and an online professional development program with renowned educator, Monte Mumford.